Used for educational institutions, retail and hospitality businesses, service and manufacturing industries, and many other demanding, professional applications, brings you a robust two-way radio solution. It has an extensive feature set including built-in voice scrambling for increased privacy, VOX capability for hands-free communication, five programmable buttons and X-Pand Technology to provide crisp, clear and strong audio quality even in noisy environments. Combined with the compact, lightweight design of the radio, you get just what it takes to enhance communication while increasing productivity. The radio is available in a Limited Keypad (LKP) model with screen. The radioMDC (Signaling Model) comes in an LKP model and a No Keypad (NKP) model, providing the right features for each user. EASY-TO-HANDLE, LIGHTWEIGHT AND COMPACT Small and lightweight, the fits comfortably into your hand and is easy to use. To provide the right features for each user, the radio is available in a Limited Keypad (LKP) model with screen, and a No Keypad (NKP) model. Voice activated (VOX) ready for hands-free communication lets users focus on the job at hand improving safety and efficiency. The programmable buttons, five for the LKP model and two for the NKP model, enable easy, one-touch access for up to 10 user-selected features. 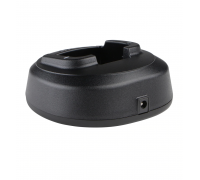 INCREASED PRIVACY Enhance your privacy with built-in simple voice scrambling and utilize the Remote Inhibit feature, using MDC1200 Signaling, for deactivation of lost or stolen radios. ADDED FUNCTIONALITY 16 channels support communication for all your employees even within larger retailers. The CP185 supports MDC, DTMF and QC-II signaling, delivering usability features such as caller ID and call alert. COMMUNICATE LIKE NEVER BEFORE Increase your coverage with repeater capability or use the Talkaround feature, which enables communication even when a repeater is not being used. Tighter audio specifications like the -70 dB adjacent channel selectivity provides enhanced rejection of interference from strong signals on adjacent channels so your message can get through clearly. STAY POWERED FOR THE ENTIRE SHIFT A Li-Ion battery provides up to 11 hours (5/5/90 duty cycle) of battery life at high power to meet the demands of your employee’s work shift. A high-capacity battery option is also available. 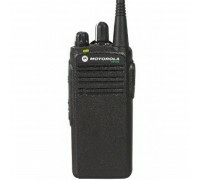 The high power option, 5 watt (VHF) / 4 watt (UHF), with adjustable power levels help extend battery life. A rapid-rate drop-in charger can charge the radios in less than three hours. 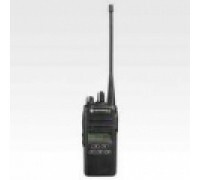 VERSATILE ACCESSORY PORTFOLIO The CP185 portables offer a wide range of Motorola Original® audio, energy and carrying accessories as well as Mag One™ audio accessories, providing an affordable option for light duty radio users.